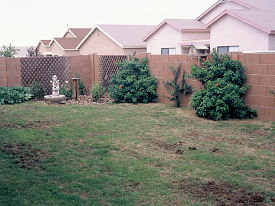 We are fortunate in the desert southwest of California to have very few sod grass related insect problems. The unfortunate thing is that most of the damage is done below ground, so you never see the insects until you see the damage they have left behind. The insects that are the most problematic are grubs, ants, and pearl scale. Insects that are present but only occasionally causes problems are chinch bugs, sod webworms, and cut worms. 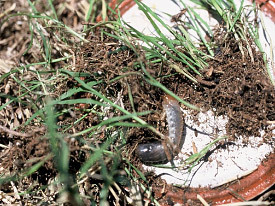 A white grub feeding on turf roots. If you find 10 or more in a square foot you better start treating them. While a healthy turf is your best defense against insect damage to your sod in California, a healthy lush lawn can also attract insects in our desert climate. One of the first symptoms of insect damage can be dry spots that look like poor irrigation coverage. Insects feed on the roots or shoots of plants, causing desiccation (loss moisture) in the plant. Grubs and pearl scale feed on the roots of the plants, limiting the ability of the turf to take in adequate moisture. Sod webworms, chinch bugs, and ants feed on the shoots (leaves) of the turf, drying out the leaf and causing it to wilt. While the symptoms tend to show up when the temperatures are at their hottest, the damage probably began a month before you saw it. Make a note to yourself to starting treating these pests next year, a full month before you saw the first signs of damage this year. Grub damage in a back yard. The birds have caused even more damage by feeding on the grubs. Early warning signs of insect damage to sod in California: Birds pecking in the sod grass can be a sign of grubs. Rubbing your hand over an area seeing a small swarm of moths fly up is a sign that sod webworms are present. If you have a lot of "June beetles" (actually they are Masked Chafers that usually hatch and fly around the month of June) flying around the street lights, you will need to treat for them in another 30-45 days. Small mounds of dirt in the turf, or small worn paths ¼ inch wide – look out for ants! Consult your local nursery or home center for the best insect control. Use only the recommended rate for insecticides! "More" is not "better" when it comes to insecticides. For more detailed information and sketches of some of these insects you can visit the Master Gardner website.